6 reasons the Apple TV 4K is huge news for Ultra HD | What Hi-Fi? Apple's TV hobby just got serious and it's sure to shake-up the 4K landscape. Tim Cook, Apple's CEO, famously used to refer to the Apple TV as no more than a "hobby" for the powers that be at Cupertino. The company's various iPhone, iPad and Mac divisions were so strong, that the relatively measly returns from Apple TV boxes and related iTunes purchases - which still ran into the billions - were seen as something of a sideshow. The staggering success of the iPhone, and indeed the higher prices of the new iPhone 8, iPhone 8S and iPhone X, mean that balance is unlikely to change any time soon. But the new Apple TV 4K box certainly does look a far more serious proposition than previous Apple TV devices, and could not only be the most compelling Apple TV yet, but potentially the most complete 4K source on the market for anyone who doesn't want to buy 4K discs. It may be late to the 4K party, but as with the iPod, this iteration of the Apple TV could yet steal the show. Apple hasn't missed a beat when it comes to the necessary specs. As well as the obvious 4K resolution video, there's support for the two biggest HDR formats straight out of the box: HDR10 and Dolby Vision. This is far from a given on 4K hardware and with Apple's preference for doing its own thing when it comes to formats, it was far from guaranteed, so it's good to see Apple saw no reason to confuse HDR matters further (ahem, HDR10+). 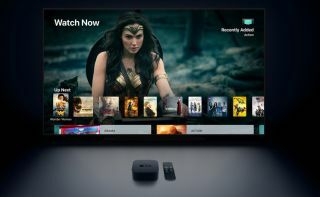 And Apple didn't shy away from mentioning two of its biggest rivals when it comes to content - both Amazon Prime Video and Netflix will be supported on the Apple TV 4K, bringing all that 4K content (we assume) with them. The Apple press site shows "coming soon" against these two services but having been name-dropped in the Apple event, we'd be surprised if punters have to wait too long. This means the Apple TV 4K already offers the two biggest players when it comes to 4K TV and films. You can also stream YouTube over AirPlay to existing Apple TV boxes, so 4K YouTube isn't out of the question either. But there's more: 4K films are also coming to iTunes. So if you prefer to download and own your content, now you can do it in 4K. And with anything up to a billion iTunes accounts in the world, depending on whose guess you believe (Apple confirmed 885 million iTunes accounts in 2014), that's a huge potential customer base that now has access to 4K video. Apple is still said to have around 30% of the market for movie downloads, and now it has a 4K carrot to dangle, too. All told, it gives the new Apple TV another 4K string to its bow. What's more, Apple has said it will charge the same price for 4K films as it does for HD films. So when it comes to buying the content, there'll be no barrier to entry for the 4K experience. This is in sharp contrast to the price of 4K Blu-rays and the premium charged for 4K Netflix (and the price of lossless and hi-res audio for that matter). And it's another reason why the Apple TV 4K could seem a tempting way to dip your toe into the 4K market. But all the above is surely only the beginning, and the means by which Apple builds a 4K-watching user base to which it will ultimately deliver exclusive 4K content. Rumours abound that Apple could bid for James Bond rights, both for existing films but also to make new ones, while an Apple video streaming service has long been rumoured. And Apple is already making inroads into streaming sport in the US. New Amazon Fire TV to feature 4K, HDR and built-in Alexa?